The numbers vary based on who you ask, but it’s generally accepted that it takes somewhere between 6 and 13 “touches” before you get a qualified sales lead. Trade shows can be a unique way to touch very qualified candidates. If done correctly, a trade show booth can put you in front of a qualified candidate more than once. You’ll want to choose a trade show that will connect you with qualified decision makers. Ask the organizers who attends the show, ask to see lists of past attendees, and ask colleagues and others if they themselves go to the show. Also make sure that you have a complete understanding of the costs involved in any specific show. Do you need to purchase your own electricity? Will you have to provide your own Wi-Fi (many trade shows are housed in old convention centers with less-than-ideal infrastructure)? Do you need extra flooring to make it possible for your staff to stand all day? Once you make the decision to go, the most important thing is to create a memorable impression. Your trade show materials should be durable (setting up and taking down a booth is a lot of wear and tear), unique, and most importantly, they should be on brand for your company. 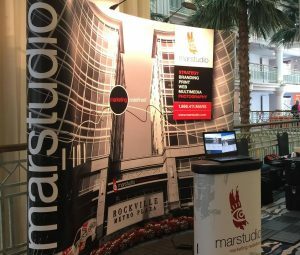 Marstudio’s booth resembles our actual physical office, giving visitors the impression that they’re walking into our business. It’s a great conversation starter, and a great way to make visitors feel like they know us. Raffles and other enticements like photo booths, beverages, interactive displays, or even celebrity impersonators are often used to attract people to a booth. These can all be incredibly effective, but it’s important to remember that you don’t just want “people” at your booth, you want people who are qualified and interested in your product or services. A very enticing raffle can mean you wind up with a lot of useless business cards to sift through at the end of the day. A display or enticement that’s super engaging, but not related to your company, can wind up taking over the booth, meaning that people pay more attention to the display than to you. Along with some paper brochures, another idea is to bring branded USBs with your brochures already loaded, as a giveaway. Giveaways should always be branded, and always be something that people will use in their business life. A comfy t-shirt may be popular, but people will probably wind up sleeping in it, not wearing it in public (unless it’s truly creative or hilarious). Stress balls and other toys will be brought home to kids to help mom and dad apologize for being away. But USBs, great pens, and other well-made and branded office supplies can help keep you in touch long after your clients return from the show. Once clients do return from the show, don’t forget to follow up. A simple casual email in the first few days after the show can be followed up with more extensive campaigns later. If you’re thinking about going to your first trade show, or even your ninth, let us know. 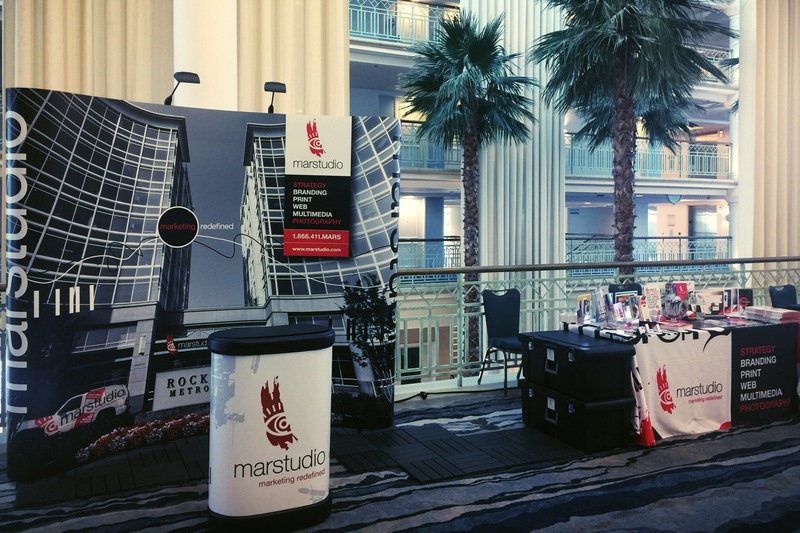 We are experienced in trade show booth design, swag design, and even print design for brochures, and we’d love to help you design the perfect experience.